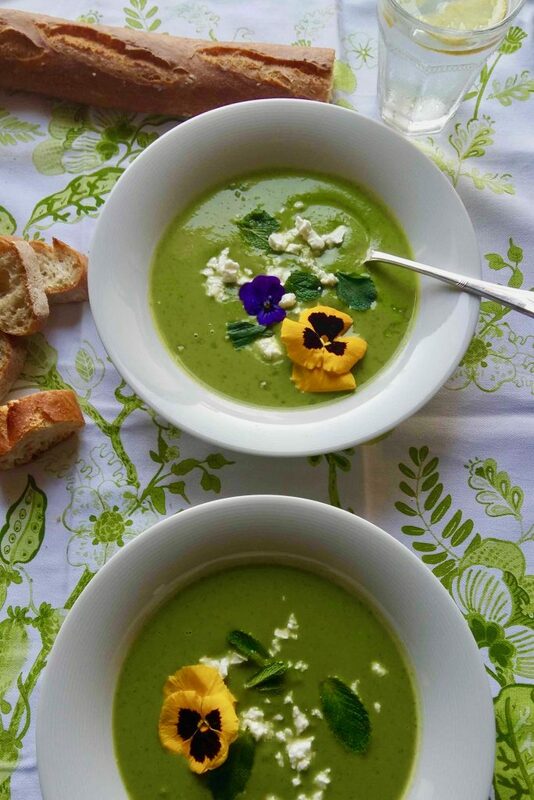 If you don’t want to sweat your summer starter – well apart from some leeks that is – then look no further than this easy-peasy chilled soup. It involves no more than around 15 minutes cooking time, can be made well ahead, is deliciously refreshing and looks beautiful thanks to its vibrant green colour. Of all the recipes in my novel Love Apples, this has probably garnered the most rave reviews, sometimes outdoing a main dish that I’ve laboured over for hours, which makes me laugh (and cry if the labour on the main was particularly intense) as it couldn’t be simpler. The ingredients are few and readily available too. It can be made with fresh peas, but frozen are just as tasty and might even have the edge on assuring that vibrant colour – aided by cooking the peas for a minimum of time, and being sure not to brown the leeks too much when softening them in butter. It’s also best to use a fairly clear stock; I sometimes use chicken rather than vegetable stock (provided there are no vegans at the table) as it’s often lighter in colour. In Love Apples, the protagonist’s mother serves the soup with crispy croutons, as does my own mum, who created this recipe, but I prefer it with a crusty French baguette on the side. A chilled white wine accompaniment is also de rigueur – something subtle with green notes and good acidity to match the soup’s fresh flavours. I love it with a sauvignon blanc, but given the peas’ sweetness, an ice cold Riesling or unwooded Chardonnay work well, and bubbles are always a good idea. Finished off with a dollop of sour cream and a sprinkling of chopped chives and edible flowers, it’s a garden in a bowl, and just the thing to kick off a sunny lunch. A lovely light precursor to a heavier main (in the novel, it’s served ahead of a Sunday lamb roast), it also works as a lunch in itself, possibly teamed with a platter of cheeses and cured meats (in which case, you might want to make a larger quantity as this recipe produces six fairly small portions). And good news for those heading into winter, you don’t need to shelve the recipe when it’s cold outside, as it’s just as tasty served warm with crispy fried bacon sprinkled on top. Hard to mess up, ‘peas’ of mind is assured with this one. Bon appetit! Spray a large pot with cooking oil. Add butter and leeks, and cook over medium heat until leeks are soft (7–10 minutes). Add stock, and bring to the boil. Add peas and, once stock has returned to the boil, cook for 3–5 minutes. Take pot off stovetop, and add mint, salt, and pepper. Blend with stick blender. Strain and set aside to cool. Once cool, put in a covered container and place in the fridge to chill for at least 2 hours (longer is better as it should be served nicely cold). To serve, pour into bowls, add a dollop of sour cream or crème fraiche, or crumble in some goat’s cheese, and top with lemon zest and pea tendrils or chives. If available, finish off with a sprinkling of pansies and violas. Serve with croutons or a loaf of crusty bread on the side. Too mouth watering! As simple as it is edible and easy on the eye. This one’s a keeper….rather like Love Apples! Okay I’ve found it – the perfect use for the crumpled bag of frozen peas which keeps my freezer drawer from closing tight. When I was small the thought of pea soup would have sent me diving under my bed and praying not to be discovered but as with age comes wisdom so I am now totally enamoroued with the little green rounds packed with sweet punch. Making them interesting however, has thus far eluded me. Better yet with barely any change in the core ingredients I can swing it between seasons. 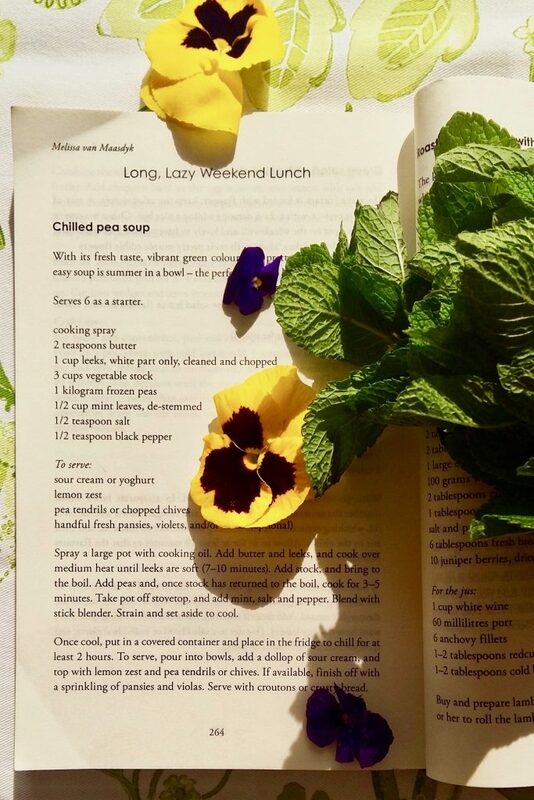 I do envy Kate, the saucy creative protagonist in Love Apples her creative eye, as violas and pansies for garnish seem to catapult this tangible recipe to a new level of foodie flare. The crispy bacon I know I can manage, but now when I pass the nursery my mind is thinking beyond the garden and into the kitchen. The art of good writing – thought provoking way beyond the page.